Cupcakes 'n Daisies: I'm Home . . . I'm Home . . .
and I didn't even tell you I was gone! I feel a little uncomfortable announcing to the world that my house is going to be empty, and to come on over and help yourself to anything that's not nailed down. For the last week I was hanging out here . . . . .
No email, no blogs, just me and my family on this beach. It was wonderful. I started each day walking the beach and picking up these, it's an addiction I have. 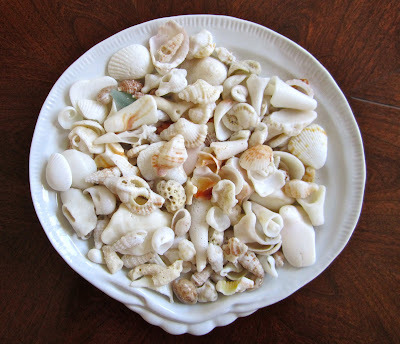 If I lived in an area where I could walk a beach every morning, I would have one of those houses where shells are hot glued to every available surface, the woodwork, the counter tops, the toilet, I can't help myself, I just love picking up shells. Luckily for my husband I don't get to the beach very often. Every summer, around my daughter's birthday, my daughter and I take a girls only vacation. This year was a milestone of a birthday so we picked a great vacation destination and even invited the menfolk. We hung out at the beach during the day and dressed for dinner each night. One day we even went to the spa to get our hair done! It was nothing but fun. So today I'm tackling a mountain of dirty clothes and unread mail, and hope to get caught up on my email and blogs. I also need to get a decent picture of my Red and White Tribute quilt. I didn't have time to get that done before vacation. As wonderful as our vacation was, it sure feels great to be home! Sounds like a wonderful vacation! You and your daughter are beautiful! Can't wait to see the red and white quilt! Been following your blog for awhile, but I've never seen your picture. You & your daughter are both just cute as can be! Glad you had such a nice girl time together! It definitely sounds like you are relaxed and had a super time with your family! That is what vacations are all about! Glad you are back. A beach full of shells is pure heaven for me!!!! I am just like you, usually never say anything about I am going, just I am back. Even though there are 3 other adults that live here now. So the house is never empty. Welcome home - I'm glad you all had such a good time. What an adorable picture of you and your daughter! You must have had a fantastic time! You and A look so adorable in your fancy out to dinner clothes! You must be so relaxed now. I had to laugh about you hot gluing shells over every available surface. I'm pretty sure I recognize that vacation spot - very fun! Whichever birthday it was, I hope it was a very nice one. Your trip looks fantastic! Where did you go? I never announce if I'm going to be gone, either. I think that's just smart. What a nice picture of you and your daughter. Just look at all of those seashells you found too ! Looking forward to seeing your red & red tribute quilt. Great pictures of you two. I love the gorgeous hair dos! Looks like you had a wonderful time. Great picture! Where did you go for your vacation, beautiful place! Great photo's, but where were you?! The beach looks wonderful! love the idea of taking a girls only vacation! may have to try that next year! Looks like you had a great time. I would love to know what location you were at, that beach looks dreamy! Glad you had a good time. You and Ashley look beautiful! Last Blast of Summer . . . .
Next Up . . . . .
Red and White Tribute Quilt . . . .
Evening Bloom - Block 5 . . . .
Eventide Update . . . .
Filler . . . . Yet Another . . . .
Time for a Change . . . .